When it comes to preserving Britain’s heritage, it is often small groups of enthusiasts who end up doing all the heavy lifting. This certainly goes for the fine volunteers behind the Stretcher Railing Society, who are campaigning to save London’s railings made of unused wartime stretchers. In the anticipation of enormous casualties during the Second World War, more than 600,000 steel stretchers were mass-produced by Steelway in Wolverhampton to be used by Air Raid Protection officers. The stretchers consisted of a wire mesh and two steel poles, while two kinks at either end of each pole allowed the stretcher to be rested on the ground and picked up easily. Despite high casualties, fortunately not all the stretchers were used and authorities were left with enormous stockpiles at the end of the war. As railings across the city had been removed to aid the production of munitions and war materials, this seemed like the perfect opportunity and stretchers were turned into railings. Across London, particularly in the south-east and east, they were welded together and fixed into position. 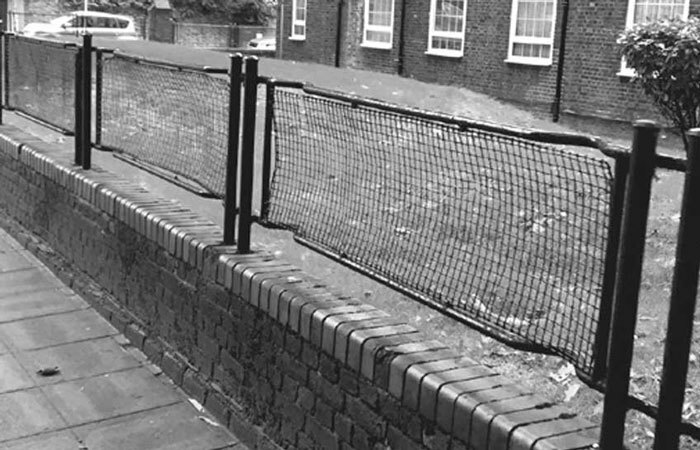 Today, there are still many post-war estates that have surviving stretcher railings, although it’s fair to say that most have seen better days. Now history enthusiasts are pooling their efforts to preserve them and have called for passers-by to send in pictures of railing sightings. Go to stretcherrailings.com – their website – for details of how to contact them.